No child’s musical education is complete without experience in composition and improvisation. These two closely related areas are included in the national and state standards because they are the creative source of music itself. When we teach composition to our students, we invite them into the inner world of music. They begin to realize the many choices that composers face, and they become more aware of the intentionality of music. As students actively use the elements of music to express their own musical ideas, they become much more fluent in the language of music. Just as a language arts program must entail reading and writing, a full music education program requires performance and composition. In order to help New York State’s teachers and students implement the composition and improvisation standards, NYSSMA established the Music Composition/Improvisation Committee in 1999. The committee conducts a statewide student composition assessment program, presents educational sessions for teachers at NYSSMA conferences, provides articles for School Music News, mentors teachers informally, and offers other resources on its webpage: www.nyssma.org/composition. Every year, NYSSMA provides composition assessment and feedback through its Call for Compositions. The Call for Compositions is not a competition, but rather an opportunity for a large number of students to receive personal feedback about their compositions. The compositions are reviewed by a panel of professional composers, and each student receives an encouraging written evaluation of his/her piece. The adjudicators highlight strong points and make positive suggestions for future growth. To learn more about the NYSSMA composition evaluation program, please read this article from School Music News. Although the emphasis of our evaluation program is on feedback rather than competition, the most outstanding compositions are selected for performance at the NYSSMA Winter Conference. The student composition concerts have become a highlight of the Winter Conference, with many first-time attendees expressing amazement at the high level of the compositions. Indeed, many NYSSMA student composers have gone on to pursue their studies at institutions like Eastman, Juilliard, the Manhattan School of Music, the University of Michigan, Yale, and Harvard. They have won such prestigious awards as the ASCAP Morton Gould Student Composer Award and the BMI Student Composer Award. Each Winter Conference features a prominent Composer-in-Residence who works with the student composers and conference attendees. Past Composers-in-Residence have been William Bolcom, Morton Subotnick, Tania Leon, Joseph Schwantner, R. Murray Schafer, Libby Larsen, Steven Bryant, Paul Moravec, Joan Tower, Chen Yi, Kevin Puts, Stephen Paulus, Christopher Theofanidis, Alex Shapiro, Abbie Betinis, Roshanne Etezady, and Dan Welcher. The student composers and interested teachers attend the Young Composer Seminar with the Composer-in-Residence, and also the Composition Coaching Workshops, which are small-group master classes in composition with professional composers and educators. An All-State performing ensemble usually performs a composition by the Composer-in-Residence, and the conductor and ensemble have the opportunity to work with the composer. In addition to the student composition sessions mentioned above, our committee presents sessions on composition and improvisation (both jazz and non-jazz) for teachers at the Winter Conference. We seek to present clinicians of the highest caliber, with the aim of providing teaching strategies and techniques that teachers can implement immediately. 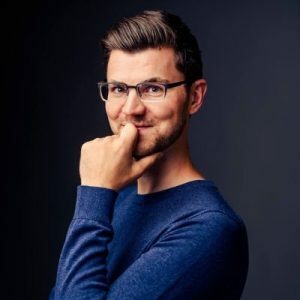 NYSSMA is honored to welcome Jake Runestad as Composer-in-Residence for the 2019 WinterConference. Jake Runestad is an award-winning and frequently-performed composer of “highly imaginative” (Baltimore Sun) and “stirring and uplifting” (Miami Herald) musical works. He has received commissions and performances from leading ensembles and organizations such as Washington National Opera, the Swedish Radio Symphony, the Netherlands Radio Choir, the Dallas Symphony Orchestra, the Santa Fe Desert Chorale, Seraphic Fire, the Louisiana Philharmonic Orchestra, the Philippine Madrigal Singers, Craig Hella Johnson and Conspirare, and many more. Jake’s visceral music and charismatic personality have fostered a busy schedule of commissions, residencies, workshops, and speaking engagements, enabling him to be one of the youngest full-time composers in the world. Considered “one of the best of the younger American composers” (Chicago Tribune), Jake Runestad holds a Master’s degree in composition from the Peabody Conservatory of the Johns Hopkins University where he studied with Pulitzer Prize-winning composer Kevin Puts. Has has also studied extensively with acclaimed composer Libby Larsen. A native of Rockford, IL, Mr. Runestad is currently based in Minneapolis, MN and his music is published by JR Music. Both New York All-State choirs will perform compositions by Jake Runestad at their concerts in Kodak Theatre. He will visit rehearsals of both bands to work with the conductors and student performers. The Music Composition/Improvisation Committee received almost 100 compositions in response to the 2017 Call for Compositions. Each student composer received a written evaluation of his or her composition. Evaluations were written by Dr. Rob Deemer, Dr. Daniel Deutsch, Frank Doyle, Dr. Mark Filsinger, Melinda Kessler, Steve Kessler, Dr. Daniel Ott, Dr. Margaret Schedel, Dr. Stephen Shewan, Dr. Andrew Martin Smith, Dr. Gregory Wannamaker, and Brian Zeller. Committee members Rob Deemer, Daniel Deutsch, Daniel Ott, and Margaret Schedel selected 12 outstanding student compositions that were performed at the 20th Annual NYSSMA Young Composer Honors Concert at the All-State Winter Conference on Friday, November 30, 2018 in the Lilac Ballroom of the Rochester Convention Center. The Honors Composers participated in a special post-concert discussion with the Composition and Improvisation Committee and in coaching workshops with clinicians Dan Welcher, Dr. Rob Deemer, Dr. Daniel Deutsch, Herbert Deutsch, Dr. Mark Filsinger, Dr. Patricia Riley, Prof. Jamie Leigh Sampson, Dr. Stephen Shewan, Dr. Andrew Martin Smith, and Brian Zeller. 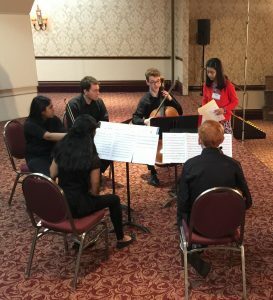 Composer Leona Liu works with a string quartet from Williamsville East High School that included 2016 composers Priya Pindiprolu (viola) and Drew Cone (cello). Watch the 2013 New York All-State String Orchestra play a movement of Christopher Theofanidis’s Visions and Miracles, conducted by David Hagy. If you have any questions regarding NYSSMA’s composition programs, please contact Dr. Rob Deemer at deemer@fredonia.edu.